So you have a wicked GoDaddy GoCentral website built. But you’re wondering how you can easily sell digital downloads on there. Well we have good news! Payhip can help you do this easily. Payhip is an e-commerce platform that enables anyone to sell digital products. 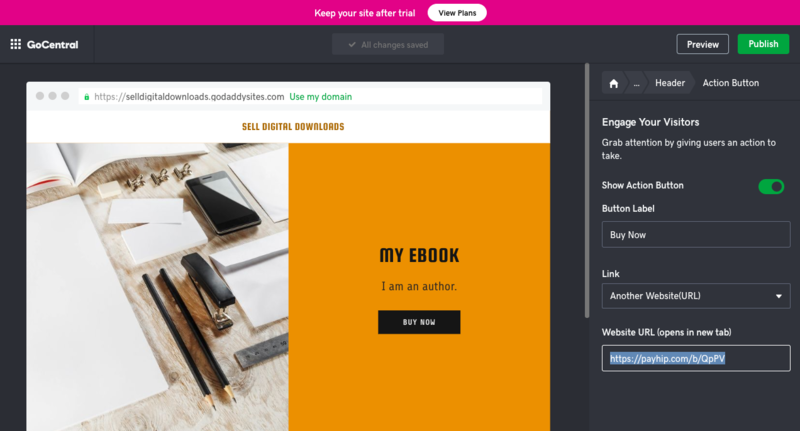 Combining Payhip with GoDaddy GoCentral website builder, you can create a website with ecommerce functionality to sell digital products easily, with no technical headaches! In this tutorial, we will show you how to sell digital downloads on any GoDaddy GoCentral website. So let’s get going. Login to your GoDaddy account and go to the manage website builder area. Then click Manage on the website you want. Then click the Edit Site button in the top right corner. Then go to the Pages section and find the page you want start selling your digital downloads on. Now that you’ve got your GoDaddy GoCentral website open, we will come back to this as we need to create a Payhip account. Now you will need to create a Payhip account which free and upload your digital products. This bit is really easy and you watch this video tutorial if you need help. Once you’ve done that, you have two options to sell digital downloads on GoDaddy GoCentral Website builder. 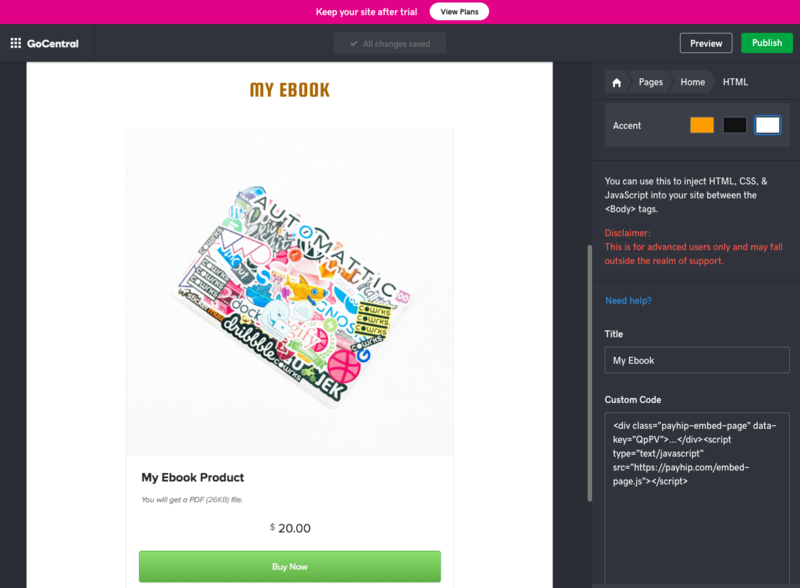 You can either simply add a buy link or embed your digital product checkout flow into your GoDaddy website. Here is how to do both of them in separate steps. 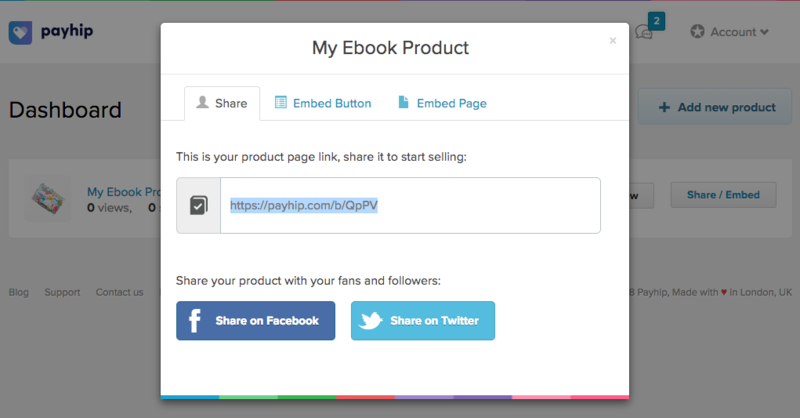 Get your buy link from your Payhip Dashboard by clicking the share/embed button. Copy the buy link from the share/embed modal. Add this to any GoDaddy button by clicking on the button and settings the “Link” option. Click “Done” and you’re all set. 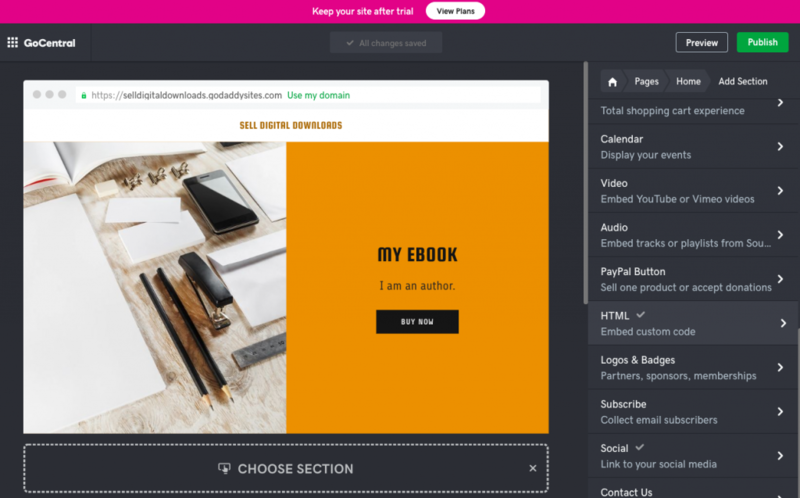 If you want a deeper integration where you customers don’t have to leave your GoDaddy website to purchase, you can use the embedded option from Payhip. You will essentially do the same thing but this time you get the embed page option from Payhip. Then add a new section to your website using the HTML block. Then you paste the embed code in GoDaddy’s HTML block and give it a title if you wish. Click done and you’re all finished! There we have it folks! 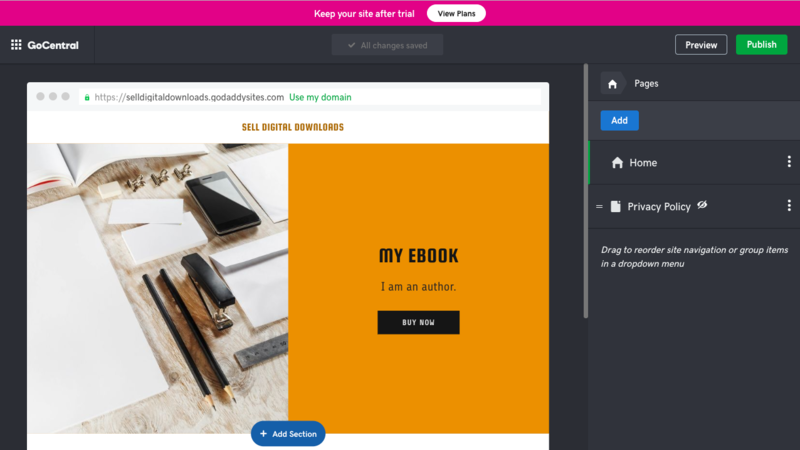 A very simple how-to tutorial on two simple options to start selling digital downloads on your GoDaddy GoCentral website builder. Any questions or comments are much appreciated! about multiple digital downloads for sale. Do I need to create a separate page for each digital option I have to sell? Hi Everett, no you can upload multiple files to each product page. Buyers will then get an option of what to download when they purchase. I hope this helps! Hi and thanks for the information. Unfortunately I do not use GoDaddy GoCentral website builder but my own sites using WordPress and Joomla. The page script provided of my product does not work on WordPress. Maybe you should post a blog article on how to do this ?